Few minutes before midnight, Venice welcomes 2019 with a fireworks show that will illuminate the Basin of Saint Mark celebrating the the new year's eve, with thousand colors dancing on the lagoon. 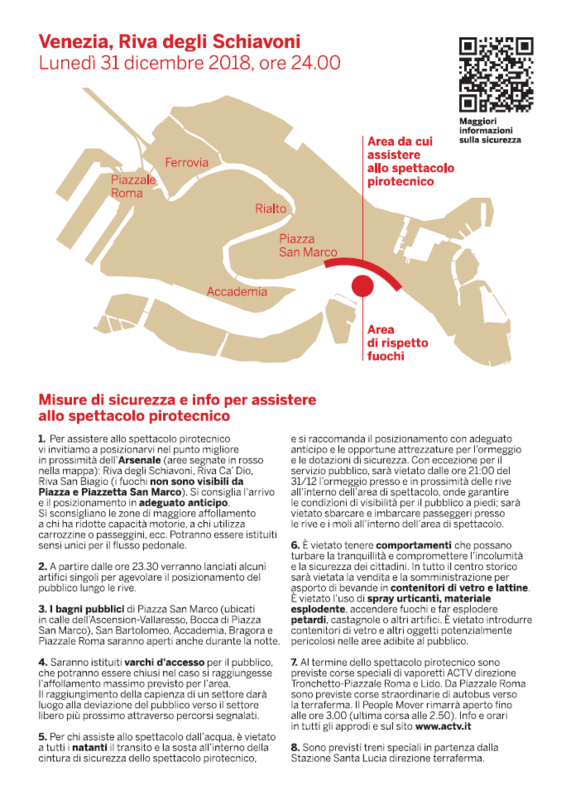 To watch the fireworks, we invite you to take the place along the areas marked in close proximity to the Actv waterbus stop ARSENALE (in red on the map Riva degli Schiavoni, Riva Ca 'di Dio, Riva San Biagio, Riva Sette Martiri). The fireworks dislapy is not visible from Piazza and Piazzetta San Marco. Starting from 23.30, individual artifices will be launched every 5 minutes to facilitate the positioning of the public along the banks. • To watch the fireworks display, we invite you to find a place along the areas marked on the map: Riva degli Schiavoni, Riva Ca 'Dio, Riva San Biagio, Riva dei Sette Martiri (the display is not visible from St. Mark’s Square and Piazzetta square). Arrival and positioning sufficiently ahead of time is recommended. Overcrowded areas are not suitable for people with poor mobility or families with strollers, pushchairs or prams, etc. One-way pedestrian flows may be operated. Several “warning” fireworks will be launched every 5 minutes starting from 11:30 pm. • Access points may be operated with possible controls by the Police Authority. Access to public areas may be restricted as the maximum capacity may have already been reached. Do not remain within the barriers and security areas. For those watching the display from the water, boats must not transit or stop in the fireworks display safety areas. • Do not behave in any way that may disturb the tranquillity of citizens or jeopardise their safety and security. Throughout the historic city, no drinks may be sold or taken away in glass containers. It is prohibited to use explosive materials, light fires, use firecrackers or any other type of fireworks. No glass containers or other potentially dangerous objects are allowed to be taken into public areas. • Special trains will be running from Mestre station to Venice, Padua, Portogruaro, Castelfranco Veneto and Treviso. • Call Center Hellovenezia +39 041 24.24 on 31st December, 2018, Call Center Hello Venezia could be contacted from 8am to 5.30pm (reservation for ferry-boat line 17 will be available till 5pm). On January 1st, 2019, it will be closed. Reservation for ferry boat line 17 will be possible online. !! On 31st December, 2018 line 17 connection Lido - Punta Sabbioni will not be carried out.